Add some instant cheer to your table with these simple and delicious dishes. 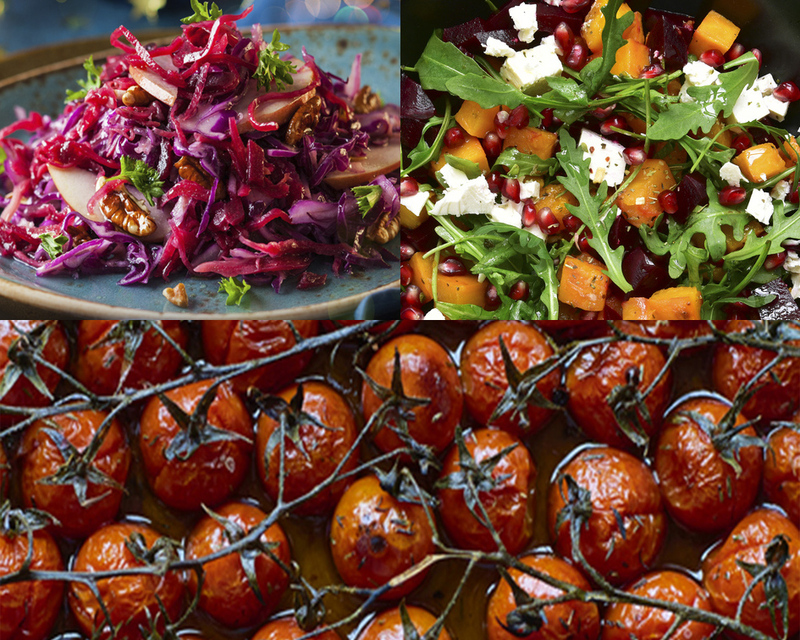 Tweak to your taste, the focus here is on easy prep, maximum impact and the wonderful colours and flavours found in fresh seasonal produce. Both the Ruby Slaw and Pumpkin Salads can be made a day ahead. All store well in the fridge and totally satisfy as post celebration leftovers. 1Line a baking tray and then drizzle melted Nuttelex over walnuts and add sugar. Toss to coat. Bake for 6 minutes, stir to ensure even roasting, and bake for another 6 minutes. 2Combine beetroot, apple, cabbage, carrot, pomegranate in bowl and mix well. 3Toss thru roasted walnuts and parsley. 4Drizzle with dressing before serving. 1On a lined baking tray, drizzle melted Nuttelex over walnuts and sprinkle with sugar. Toss to coat. Bake for 6 minutes, stir to ensure even roasting, and bake for another 6 minutes. 2Place chopped, pumpkin & sweet potatoes on lined baking tray, dollop 3 table spoons Nuttelex all over veg, add salt, cook till golden and slightly browned (at least 50 mins). 3Finely slice onions and place in a large pan with the olive oil. Turn heat to low, stir continuously until caramelised- usually 35 mins. Just before you remove from stove stir thru a splash of balsamic vinegar. 4On a long platter place a layer of rocket, a sprinkle of walnuts, scatter cooled pumpkin & sweet potatoe pieces, and then scatter over some onions. Repeat. Top salad with the goats cheese, feta or crispy tofu. Dress with a good splash of both the oil and the balsamic. 1Grease baking tray with Nuttelex. Arrange tomatoes still attached to vine in lines across the tray. Using the Nuttelex set aside for roasting, add tiny knobs of Nuttelex thru the vines. Add thyme. Bake at 170C till beautifully roasted and browned. 2Serve in baking tray with a sprinkle of salt & pepper and a splash of balsamic glaze.